Handy durable belt loop attachable pouch for Field Note book and accessories. Fold-over flap with buckle closure accomodaties your 4 5/8" X 7" sized notebooks. Extra room to store other related supplies. 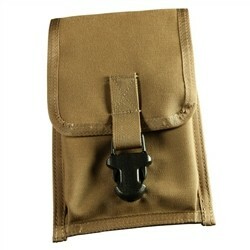 Tan Canvas with belt loop mounts. CORDURA® fabric Pouch fits book, pens, & acid bottle. Improved design has an easy open clasp and two waist clips on the back - No belt needed!. Fits all 4 3/4 in x 7 1/2 in bound books. Also fits any standard sized notebook. Specifically designed for geology work, this case can be used with any standard Rite in the Rain Field Book.